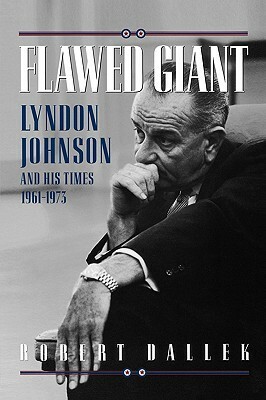 Published in 1998, “Flawed Giant: Lyndon Johnson and His Times 1961-1973” is the concluding volume in Robert Dallek’s two-volume series on LBJ. Dallek is a retired professor of history and the author of nearly two dozen books including a bestselling biography of JFK (which I enjoyed) and a more recent dual-biography of Richard Nixon and Henry Kissinger. This final volume in Dallek’s series covers the last twelve years of Johnson’s life beginning with his unhappy service as Vice President. Following a brief discussion of JFK’s assassination, the balance of its 628 pages march rigidly (but not always chronologically) through LBJ’s five-year presidency and his four-year retirement in Texas up through his death. Although Dallek used the first volume in this series to rehabilitate LBJ’s image (which he believed was unfairly tarnished by previous biographers), this volume wastes no time worrying about third-party opinions. But much like the previous volume, Dallek’s assessment of his subject in “Flawed Giant” is impressively and almost ruthlessly well-balanced. He never fails to point out the silver lining LBJ’s darkest clouds, but rarely withholds blistering criticism of Johnson where it is warranted. More than 80% of this biography is focused on Johnson’s presidency, and because Vietnam consumed so much of the Johnson administration’s time and energy it is not surprising that foreign policy crisis pervades this book. Unfortunately, readers familiar with the war – but not its politics – will find little familiar ground here. And readers who know little about the decade-long morass will learn virtually nothing of the war itself…but will be fully exposed to the political challenges it created. Johnson’s “Great Society” receives significant attention, particularly in early chapters, but individual pieces of legislation are rarely examined or evaluated in an illuminating manner. Instead, discussions relating to LBJ’s domestic agenda tend to be sterile and “matter-of-fact.” Similarly, the review of his 1964 presidential campaign against Barry Goldwater (which I expected to be lively and engaging) was informative but extremely clinical. Like the first volume in this series, “Flawed Giant” is far more a political biography than a personal one. I cannot recall his children being mentioned more than once, and Lady Bird appears only sporadically and remains hopelessly remote. Reference is made to LBJ’s penchant for philandering but because it apparently had no impact on his political career (or, apparently, his marriage) the topic is never pursued for more than a sentence or two. While much about this book is “fine,” Dallek does an excellent job introducing LBJ’s White House aides (his long-time deputies as well as JFK “hold-overs”) and provides an interesting review of the 1968 presidential campaign which Johnson chose to sit out. The ambivalence LBJ demonstrated relating to a potential re-election bid and his difficulty selecting a “favorite” to support in his stead are quite well-described. Finally, Dallek does an admirable job during the course of the book – and series – creating a comprehensive portrait of an extremely complex and contradictory personality who, it seems, is impossible to fully observe, evaluate, interpret and explain. Overall, “Flawed Giant: Lyndon Johnson and His Times 1961-1973” (as well as its predecessor volume) proves far more satisfying as a record of Johnson’s political career than as a narrative of his life. While it is a solid (if not excellent) historical study, it is not a particularly lively, colorful or tantalizing biography. Another excellent review, Steve. Thank you. A quick question: Where do you want general questions or questions about previous biographies? At the end of the most recent review or at the bottom of “the best presidential bios” section? I ask, because I just finished Jean E. Smith’s bio of FDR. I agree with your accolades and I appreciate your comment about the lack of full-fledged summary. I recently bought his biography of George W. Bush. It has the same superb writing style as in FDR. After skimming the preface, my guess is that fans of President Bush will dislike the book and critics of his presidency will enjoy it. I am finishing the one-volume bio of George Washington by James Thomas Flexner, before reading Joseph Ellis’s and Ron Chernow’s books. I am going to try to limit myself to 2 to 4 biographies of each president because I also want to spend time with the Oxford histories, and works from the reading lists of Robert Remini’s history of the U.S., and Arthur Schlesinger, Jr.
I’m indifferent as to where comments/questions go, but I think most people will expect to find biography-specific info at the bottom of the page of that specific review (assuming I’ve already read the book!) But if the comment / question / observation goes to a comparison of more than one book the “Best Bios of…” is probably the right place to go. Last: I’ve already committed myself – at some point in my life – to ensuring I’ve read everything I can get my hands on that Robert Remini authored. He doesn’t have the narrative flair of Chernow or McCullough but everything I’ve read by him is penetrating, insightful and uniquely interesting. I really enjoyed Smith’s biography of Bush, even though it’s much more negative than a lot of writers would be. His portrait of Bush the Man is moderately sympathetic, but there’s no question he views W.’s post-9/11 path as a national catastrophe. I’m sure we’ll be arguing about his legacy for decades so no surprise it’s attracting flak. I will second Steve’s comments on Robert V. Remini, his work (especially his Henry Clay bio) is phenomenal. …and FWIW, Dallek’s bio of JFK was my favorite “traditional” comprehensive bio of Kennedy. He is a better historian than most, but not generally as fluid and descriptive as an author. It will be interesting to see how his upcoming bio of FDR turns out.